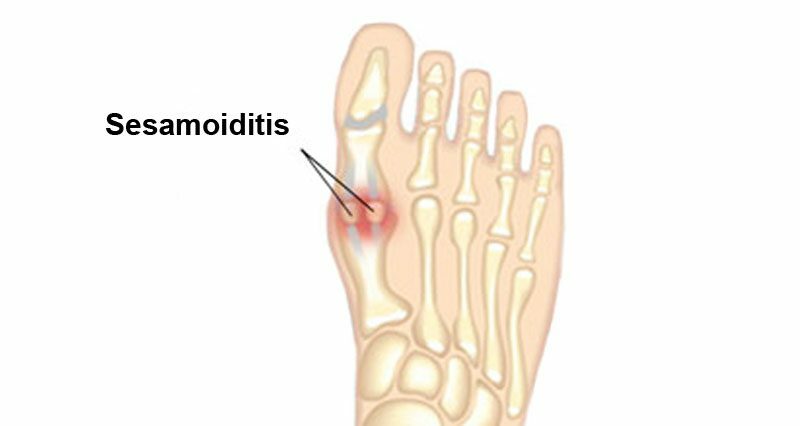 Sesamoiditis is an inflammatory condition affecting the sesamoid bones of the 1st metatarsophalangeal joint causing pain in the forefoot. It is caused by overuse and repetitive impacts, particularly if there is an increase in weight on the forefoot, like in dancing. Pain will normally come on gradually and there will often be swelling and inflammation. Symptoms of Sesamoiditis will include a gradual onset of pain in the forefoot, especially when weight bearing. There will be tenderness over the under surface of the joint. The athlete may limp or shift their weight onto the outside of the foot when they walk. There is likely to be swelling and inflammation. Pain may be recreated when moving the big toe against resistance. The Sesamoid bones are two small bones which are embedded in the tendon of the Flexor Hallucis Brevis muscle just under the base of the big toe. The purpose of the Sesamoid bones is to protect the tendon of the flexor hallucis longus muscle, increase the strength of the muscle by giving it a mechanical advantage by acting as a level and take on most of the weight bearing on the inside of the foot. In 30% of athletes, one of the Sesamoid bones is split in two, called a bipartite sesamoid. Sesamoid bones can be injured in a number of ways including stress fracture, traumatic fracture, a sprain or damage between a bipartite sesamoid bone as well as injury caused by the movement between the Sesamoid bone and the metatarsals bones in the foot. Sesamoiditis refers to an overuse injury which develops over time due to repetitive impact. An increase in forefoot weight-bearing activities such as dancing is often the cause. Stress fractures in the Sesamoid bones are more common in sports where acute changes of direction are required such as basketball, dancing, tennis, and badminton. A traumatic fracture refers to the fracture of the Sesamoid bones caused to be a single traumatic impact. An X-ray should be done to confirm or rule out a fracture of the Sesamoid bones. An MRI or bone scan may be required to identify the early stages of a stress fracture which is unlikely to show up on an X-ray. Overpronation should also be considered as a factor which can increase the risk of Sesamoid injury as over pronation may cause sideways displacement or movement of the Sesamoid bones which can cause wear and tear under the first metatarsal bone in the foot. Treatment of Sesamoiditis will initially be rest and applying cold therapy treatment to ease pain and inflammation. A doctor may prescribe anti-inflammatory medications such as ibuprofen to help reduce inflammation and pain. Electrotherapy treatment such as ultrasound therapy may be used to help reduce inflammation. Padding under the foot may be used to take the pressure off the painful area on the bones. Likewise, a shock absorbing and cushioning insole may be used to take the pressure off the painful area. Possible causes of the condition such as overpronation should be corrected using insoles and modifying technique if required in certain sports. If the above fails, corticosteroid injections may be used. If a stress fracture is suspected or diagnoses with MRI or bone scan then 6 weeks complete nonweight bearing rest in a plastic or plaster cast is recommended. Stress fractures are prone to not healing properly in which case surgery to pin the bones together or surgically remove the Sesamoid bones may be indicated. This, however, is a very last resort as the loss of a Sesamoid bone and the lever function it provides will also result in muscle imbalance which can result in further complications.